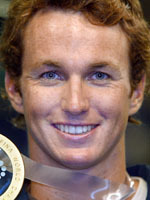 Aaron Peirsol may go down as one of the greatest backstroke swimmers of all time as the reigning Olympic and world champion targets an Athens repeat of his 100m and 200m gold sweep when he takes to the pool at the ultra modern Ice Cube aquatic complex when the battle for swimming supremecy takes place in Beijing. US gold medalist Aaron Peirsol swims during the men's 200m backstroke final, 25 July 2003 in Barcelona, at the 10th FINA Swimming World Championships. He is the overwhelming favourite in the 100m race after lowering his own world record on July 1, 2008, touching home with a time of 52.89secs to shave .09secs of his previous mark as he won the American Olympic trials in a field he described as the best he has ever swam in. To emphasise his dominance in the 100m race only takes a quick look at his previous achievements. He won the world title in 2003, 2005 and 2007 at Barcelona, Montreal and Melbourne respectively while his Olympic triumph in the Athens pool simply underlined his status as the world number one. Peirsol is only slightly less dominant in the 200m discipline having won three straight world titles and the Olympic gold in 2004 before his first defeat in seven years at the 2007 worlds when compatriot Ryan Lochte edged him into second in Australia. He became only the fifth swimmer (fourth American) to sweep the Olympic backstroke races with his acheivements in the Greek capital. Only one man has completed back to back doubles and that was the legendary East German Roland Matthes who pulled off the feat in 1968 and 1972. While individual golds in the 100m and 200m races are a distinct possibility in China, a third title as part of the powerful American 4x100m medley team also appears on the cards when they will compete as defending champions and boast a certain Michael Phelps amongst their ranks. A guy who loves his surfing and going to the beach, the Californian who was born in July 1983 shot to recognition as a 15-year-old when he became the youngest American to break 2 minutes in the 200m backstroke at the 1999 Spring National championships. He then competed at his first Olympiad in 2000 and took a proud silver in the 200m when only teammate Lenny Krayzelburg deprived him what would have been a spectacular acheievement for the then 17-year-old. Despite settling for second, the sky was the limit as far as his future was concerned and he won his first world gold one year later when he took the 200m title in Fukuoko, Japan. That was just the beginning as he now heads to Beijing with eight world titles and two silvers besides his hat-trick of Olympic golds from Athens. He studies at the University of Texas but still considers California his home. His sister Hayley is a world class swimmer in her own right while Aarron is also a handy athlete in water polo, basketball, baseball and soccer.